LUCY BURDETTE: What do you think of the Christmas in July trend? To be honest, I've always considered it a hokey idea. Shouldn't a normal person get on with enjoying summer and not try to trump up interest in a holiday that's still six months away? For those of you who don't know, copy edits are--I should put this politely, because it's a public blog and who knows who might be reading--necessary but maddening. These are not the editing notes from my editor, who is smart and laser-eyed and chock full of good ideas for making a story better. This stage consists of nit-picking. Don't get me wrong--I'm happy when they find things like misspellings, and missed capitalization, and incorrect geography--mistakes that I would much rather hear about before the book is published. 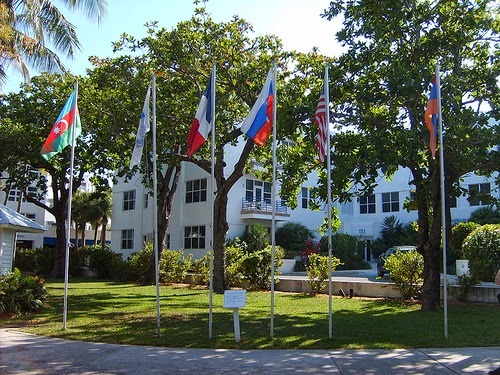 For example, someone noticed that I'd written AZURIASTAN as the name of a country whose flag is flown on the grounds of the Truman Little White House in Key West. There is no such country! The flag in question is from AZERBAIJAN. Where did I even find that made up name? Whew, embarrassment averted. Better still, I managed to turn that error into a blooper made by Hayley's ex--pure fun. And I learn things during the copyediting stage, too, like "brunet" is the correct spelling for a man with brown hair, "brunette" for a woman. And Bloody Mary has both words capitalized. But there are also hundreds of changes in things like dashes, and commas, and hyphens. Which sometimes seem utterly random. And the enemy of individual writing style. Even the recipes at the back of the book are not immune from the copy editor's eagle eye… AU: Shouldn't it read fold rather than stir since it's easy to over-beat whipped cream? My job is to remember that though it may feel like I'm being tormented, the copyeditor's job is to make the book better. And that brings me to the second gift--that of rereading DEATH WITH ALL THE TRIMMINGS after resting from it for several months. This stage is so much more pleasant than the one Hallie described on Tuesday--that awkward beginning, when you have no words on the page and can't imagine where you'll find them. So Bloody Marys all around--Merry Christmas dear Reds! My cell phone bleated from the deck outside, where I’d left it to avoid procrastinating via text messages, Facebook updates, or simply lounging in the glorious December sunshine with our resident cats, watching the world go by. The biggest interview of my career as a food critic was scheduled for this afternoon and I wanted—no, needed—to be ready. Miss Gloria would relish the opportunity to chat with her anyway, and maybe her intercession would slash my time on the phone with Mom in half when I returned the call. I am crazy about my mother, honest. But it had still been a shock when she announced she’d rented a place in Key West for the winter season. Wouldn’t it be so much fun to spend Christmas in paradise together? And New Year’s . . . and Martin Luther King Day . . . and Valentine’s Day? You get the picture. Mom had followed Diana Nyad’s attempts to swim from Cuba to Key West with rapt attention. When Diana overcame sharks, jellyfish, rough water, and advancing age to complete her 110-mile swim on her fifth try, at age sixty-four, Mom took it personally. My mother had been a little down since the summer because her fledgling catering company had not taken off the way she’d hoped. Although she’s an amazing and inventive cook, the business part of owning a business eluded her. For her first five catering events, cooking with only the highest-quality ingredients, she’d lost money rather than making it. A lot of money. Even her newish boyfriend, Sam, who was supportive beyond any reasonable expectation and categorically opposed to meddling, had suggested she take a few steps back and reconsider her plan. Whoa. If that was her dream, who was I to stop her? But my big solo adventure on this island was about to turn into How I Met Your Mother. Well, I must admit that nit-picking copy editing doesn't sound like a lot of fun, but it doesn't sound like torture, either. Do you ever ignore the copy editor's suggestions and leave something the way you had it originally? As for Christmas in July . . . I'm all for it if they play Christmas carols --- it seems like the carols come and go in a flash in December . . . . Thanks for the peek at "Death With All The Trimmings" . . . . I'm really looking forward to finding out how things go when Hayley and her mom get together. I collect Hallmark ornaments, so I've been celebrating Christmas in July for almost two weeks now since they Premiered part of their 2014 ornaments on the 12th. Looking forward to reading this book, and I should be up to date on the series by then, too. Joan--I do ignore some of the suggestions, especially if I feel they change the intent of what I wrote. Soooo jealous, Lucy! a) you're getting to reread a wonderful book and b) YOU'RE DONE! Back then I thought it was lovely. Something to do between the color (colour?) wars. I love the shout out to Diana Nyad! Christmas in July...I once gave a Christmas wedding shower for my cousin. They'd had so many other parties, and I wanted to be unique, so we did a Christmas tree and trimmings party. It was in July, but lots of fun. Copy editors seem to be an under-appreciated bunch. I often get asked for recs for freelance copy editors. Unfortunately, many are layoffs from the newspaper industry. As an editor for several books and other writing projects, I like to think I helped save the writers from embarrassment. When I've been the one on the author side I do appreciate being yanked from the brink. When I went to the grocery store the other day I was horrified to see not one, but two Salvation Army bellringers. While I can understand the need to raise funds all year long, that is not the way to do it, as far as I'm concerned. It makes the red kettle at Christmas too commonplace to pay any attention to. Ramona, the shower sounds like great fun--very clever! Karen--eep! I totally agree with you on the Salvation Army red kettle and bell ringing--save it for the holiday season! That cover begs to be purchased and read! 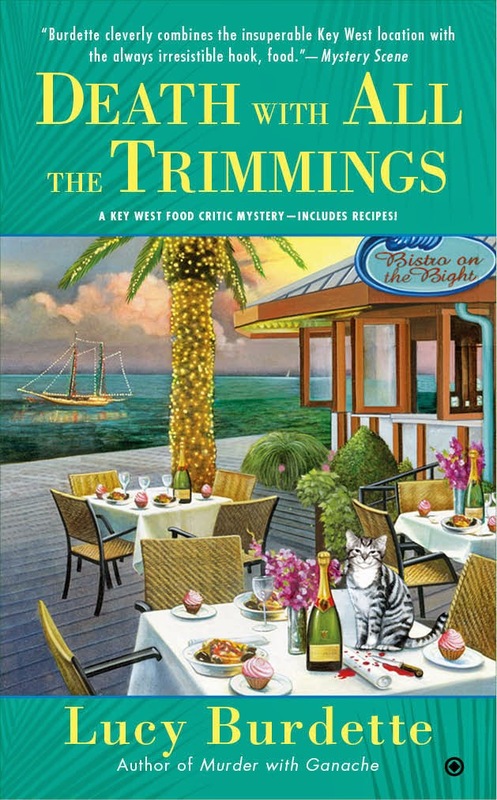 Thanks for the sneak preview -- love the idea of a Key West Christmas (with recipes). Like Hallie, I experienced Christmas in July at camp (4-H Camp) but I don't remember what exactly we did to "celebrate." At this point in my life, I am happy to have July all month -- especially this summer on Cape Cod, when we have had glorious weather. Ramona, I used to give Christmas ornaments as wedding gifts. A starter kit of some glass balls, two strands of lights, and a special ornament or two that spoke to the couple's interests. Sometimes I made a tree skirt. All that stuff is so expensive, and I remember when I was a newly married woman and someone gave us a tiny tree, ornaments, lights and a topper. Which I still have, and still use. Karen, what a nice idea for a gift. The homemade tree skirt would be a lifetime treasure! My next book is set in May, and I'm sure I will be madly typing in the deep mid-winter. But it seems to me that Christmas would be a special challenge. Is the book coming out just before Christmas? You know I eagerly await!!! Debs, yes definitely weird to be writing in a different season. Luckily much of the draft was hammered out last winter, when I was in Key West over the holidays. But I know you realize this second challenge--writing about a place where you are not located? For example, how do you write about London, when you're in Texas? It's coming out December 2--thanks for asking!! Great essay, Lucy! It's interesting to read about each part of the process - from Hallie's beginnings to your satisfaction in being able to read your novel before it goes to press. The copy edits stage is such an exciting time, because you know the heavy lifting is done. Of course, it is then followed by another one of those new beginnings :) Congratulations on wrapping this one up. And as for Christmas in July - since I'm enduring Arizona heat right now, it sounds pretty nice! Seriously, I keep a notebook, and every day I write down the date and different observations about the weather. That way, if I'm writing about June in December, I can thumb back through my notebook and find some inspiration for the color of the air, the heat (or lack thereof) and other aspects of the season. My best friend gave us a Christmas tree as a wedding present. She wanted to do "something different." And my aunt made a tree skirt. We still have them 18 years later. As much as I love Christmas though, I don't do it in July. Of course, both of my kids have July birthdays so I'm a bit busy. I'm sure the nit-picking would drive me crazy. And not sure that all of the suggested changes would improve your writing. But I love this excerpt and can't wait to meet Haley again. I enjoy Christmas in July. Not the commercial or even the traditional aspects of it, but because I love Christmas decorations, movies, stories and even listening to the Christmas-themed radio shows on Classic Radio. So when my family looks at me funny because I am watching "White Christmas" yet again, I just say "Duh - it's Christmas in July." Mary said: "fold not stir," who knew copy-editors were foodies too? Grandma Cootie, you are truly a fool for Christmas--so cute! Trust me, Lucy, my notebook is anything but organized. It's a lot of scrawl. But it does the trick when I'm writing in one season and need a nudge to find my way into another one for my fictional characters! Lucy/Roberta, that snippet from your book drew me in. Can't wait for it to be out. As for Christmas in July, noooooooooooo. Just read that in and out business. Sounded weird. Oops that was me again. Can't write and talk at the same time. Having spent years working in retail, I'm used to Christmas coming a bit early. But for me personally? It starts after Thanksgiving. One holiday at a time! I'm glad I'm not the only one who feels that way about commas and hyphens! My kids got "Christmas in July" at camp every year, too. I do something similar to Hank's trick to keep me in season (usually snowy and cold!) while writing: I have pictures of wintery scenery, storms, etc. They can help put me in the mood. Copy edits aren't fun, but I have a wonderful copy editor, the same one I've had for the past three or four books. She understands my writing style, which cuts down on my STETs enormously. Everyone who loves to read should be reading these posts this week on the stages of writing and publishing a book. The amount of detail that you authors have to get right is amazing and rather daunting. Lucy, I had no idea that brunette/brunet had the two spellings and uses. Christmas in July? I wouldn't mind it too much. I love the lights and festive feelings. 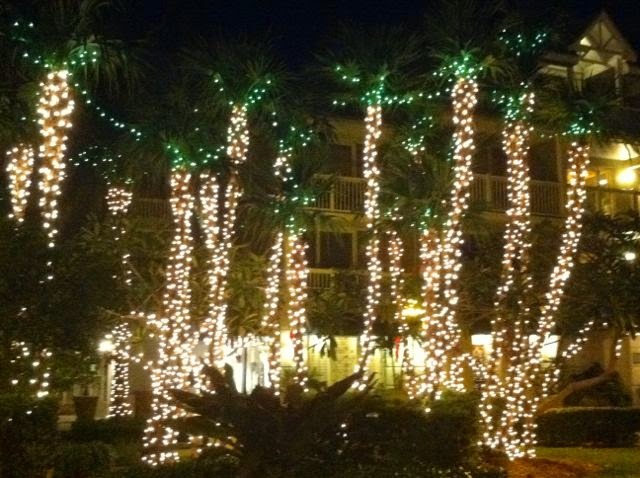 And, actual Christmas in Key West? I've done that, and it was as much fun as Christmas in paradise should be. We all ate out at an upscale restaurant for Christmas Eve, and for Christmas Day, we (well, the griller) fixed cobia caught that morning by some of our party. Heavenly! Lucy, I am so excited about Death With All the Trimmings. Haley and her mother spending it together in Key West should be unpredictably fun. And, I so agree with Denise Ann that the cover is gorgeous and so inviting. The preview was much appreciated and enjoyed. Lowercase all articles (a, the), prepositions (to, at, in, with), and coordinating conjunctions (and, but, or)"
However, in the title of your new book, Lucy, it just looked strange to me to not capitalize the preposition "with" in the title. It would have looked like this: Death with All the Trimmings. So, I went against my years of training and capitalized the "with." While not many people spend time worrying with this issue, I actually find it rather fascinating. Maybe I should be a copy editor. Hahaha! Anyone else have thoughts on the title capitalization rules? Oh, and some, like the Associate Press, do capitalize prepositions and conjunctions that are four or more letters long. Again, I'm interested in what you professional writers think about it. I will just say that for my prize winning hardcover, I agreed with 90% of my EDITOR's suggestions and 10% of my COPY editor's suggestions-- but among the latter was a misuse that both my editor and I missed, and I am forever grateful for that catch. Kathy, yes! you should be a copy editor. Ellen, one found mistake is worth a lot of pain, isn't it? This looks like such fun! I can hardly wait!
. . . and while the nitty-gritty editing isn't fun, this reader thanks you for doing it. Any time I help edit something, I remind the author that my suggestions are just that, and can be over-ruled by the one whose creative energy and name are in and on the work. When reading something pre-publication, I'll read more slowly and carefully and take notes IF there's still time to make changes. Storyteller Mary--you sound like a GEM of a reader! !